Version of the Spyder supercar Lamborghini Aventador will be already on the upcoming exhibition in Geneva in March, but thanks to the ubiquitous spies, look at the car, you can now. 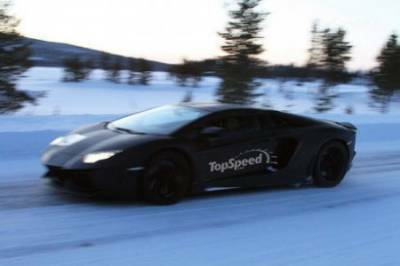 The car was spotted in northern Sweden, where he underwent tests. Recent pictures show what was previously hidden under the camouflage tape: a folding roof. It also appears that the roof can be made from carbon-fiber fiber instead of the usual matter of which made ​​the roof roadster Murcielago. Everything else - from the appearance and finishing performance - is akin to the twin-compartment. Anyone who wishes to acquire convertible, get a car with a twelve-V-twin engine power of 700 horsepower, which could make dispersal to "hundred" for 2.9 seconds and reach a top speed of 350 km / h.